"Hello, hello," said Lapinette. "Ground control calling the Wabbit!" The Wabbit sat up with a jolt. "Where were you?" asked Lapinette. "I was in my deep unconscious," said the Wabbit. "Well, you certainly weren't here," said Lapinette. "What's in there anyway?" "Lots," said the Wabbit. "I phoned Snail from inside a washing machine and apparently I can sometimes be pompous. "Never!" said Lapinette disguising a smirk. "I learned I can be all sorts of things," said the Wabbit, "and that my unconscious is rather full." "Full of ... ?" prompted Lapinette. "Electrical goods," said the Wabbit, "and there's an Agent of Rabit who lives there permanently and he won't leave." "I can't imagine why," smiled Lapinette, "but please continue." 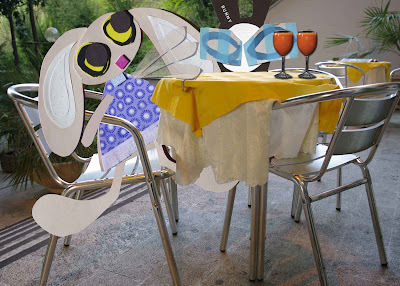 "Then I met Franco when I was a ferryman on a German police barge," said the Wabbit. Lapinette grinned at the thought. "Perhaps you were going to the Unterwelt, what was it like?" she asked with a straight face. "More pleasant than you might think," said the Wabbit with enthusiasm. "There were woods and a lake and a water witch who looked like Ghost Bunny. She brought us aperitivi and flew off on a giant carrot." "Your unconscious life is rather rich," commented Lapinette, who was beginning to get thirsty. "So is that where all your bad jokes come from?" she asked. "I forgot to mention that," said the Wabbit.